I can still hear the crickets screeching — their shrill sounds piercing the stillness of the night. During monsoons, the frogs would join in — their croaking growing louder only to stop and start again. Beetles, big and small, black and shiny, would take flight homing in on tubelights — their thrum and hum adding to the cacophony. And a lone owl, always a lone owl, would hoot and pause, and hoot again. The orchestra always comes alive after dusk. 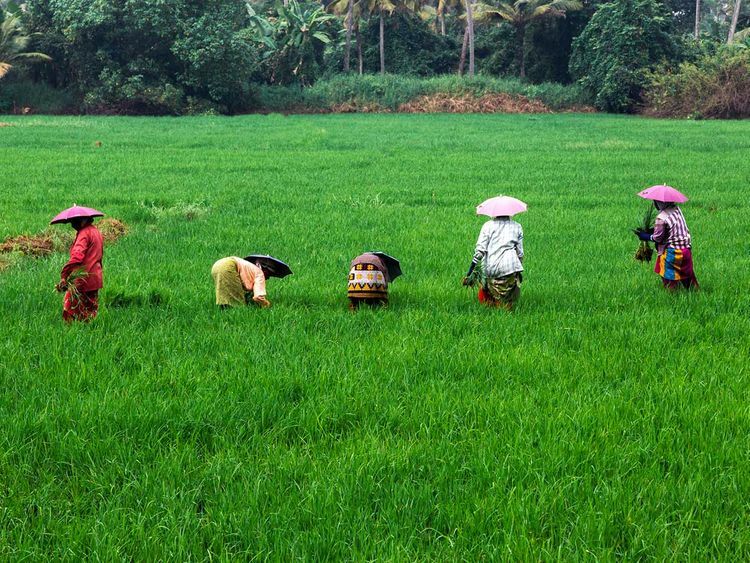 My home in Kerala (a southern Indian state) overlooked a paddy field. The field that started in front of my house ran all the way down to the river (it’s actually a rivulet). It was like an endless expanse of green carpet stretching into the distance, where a pipal tree hosted parakeets that seemed to quarrel all the time. It was soothing to watch the paddy sway in the wind every day. Cool breezes would wash over our home, wafting through the rooms. We hardly needed fans. It wasn’t always green and picturesque. Harvests would leave behind clumps of paddy stumps in the brown sun-baked fields in summer. That’s when they became playing fields. These are some of the images from the past — memories from my childhood. Sights that my children had never seen, and sounds they never heard. I decided to change all that one summer. During vacations in Kerala, my children would sit at home, eyes glued to the television. Smartphones and WiFi had not intruded into our lives. Their options were limited to television. The two barely spoke Malayalam, so they refused to go out and play with the kids in the neighbourhood. One morning, I announced that we are going to see a paddy field. There will be herons and storks waiting patiently to catch fish. Maybe we could get some photos as well. My children didn’t seem too enthused, but joined me at my insistence. The paddy field in my neighbourhood was no longer there. It had made way for houses. Yet, I was sure of finding waterlogged fields with saplings further away. We kept walking, but there was no sign of paddy. Or the storks. Or the herons. The thin paths have widened into dusty roads. We crossed the bridge, and walked past the river. There was no field at all. Concrete houses had sprouted everywhere. The fields have been brutally scrubbed out of existence. I was crestfallen. I didn’t bother to check the pipal tree and the parakeets. Well, my children didn’t get to see the field. They couldn’t hear the frogs croaking in the rain, or see tiny frogs slip through our front door. They won’t sprint through the paddy fields with wind in their faces. They won’t have the chance to catch fish with bare hands from the stream that ran along the fields. Much water has flown through the stream since then. My son has become a young man. And my daughter is grappling with adolescence. Smartphones have brought YouTube into their palms. They see paddy fields, frogs, beetles and crickets on the screens. But they will never appreciate the endless patience of a heron. Or the flight of a stork, as it flapped right in front of your eyes. Or feel the squelchy earth beneath their feet. My children live a life away from Kerala. So my experiences will remain alien to them. Like the sweet aftertaste of wild gooseberries. The joy of devouring sour green mangoes, mashed with chillies, salt and coconut oil. The warmth of cashew fruit juice dribbling down my fingers, staining my shirt. How will they remember their childhood? What are their fond memories, I always wonder? They will have special moments to reminisce. Of experiences that left a deep impression on them. Images that bring a smile to their lips. Or tears to their eyes. They certainly won’t be about paddy fields with leaping frogs, statuesque storks and buzzing beetles.